The launch fleet of five Volvo B9R Caetano coaches, four of which are brand new. The Smart Boarding Pass which is part of the ticketing solution developed by Cobham Systems of West Sussex. 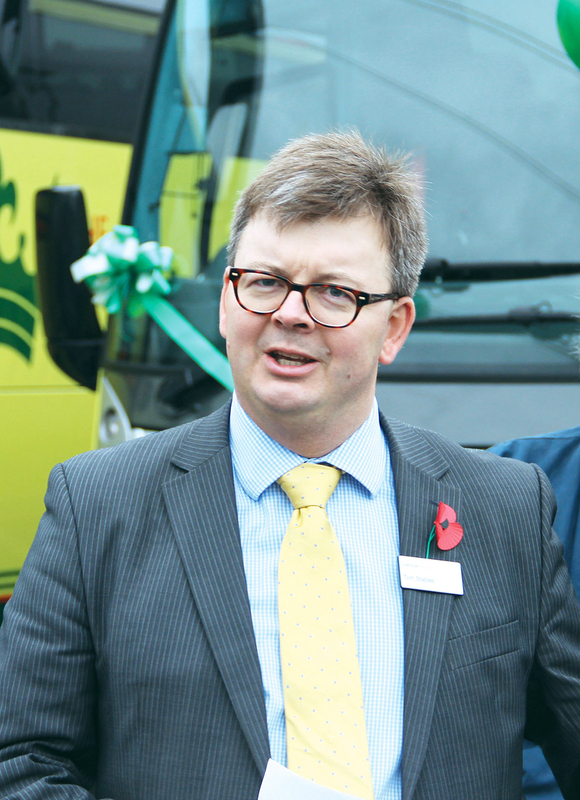 Tom Stables, MD, National Express UK Coach. The 49-seat interior of one of the four new Caetano coaches. The new B9R Caetanos are equipped with Hidral front entrance lifts. The first Weston-Super-Mare departure point is the car and coach park on Locking Road, across the roundabout from the railway station. The Kings Ferry launch team with (LtoR) Mark Purchase, Ian Fraser, Tom Stables and Danny Elford flanked by drivers. Elfan Ap Rees, Tom Stables and NSC Chairman, Alan McMurray, celebrate the launch. 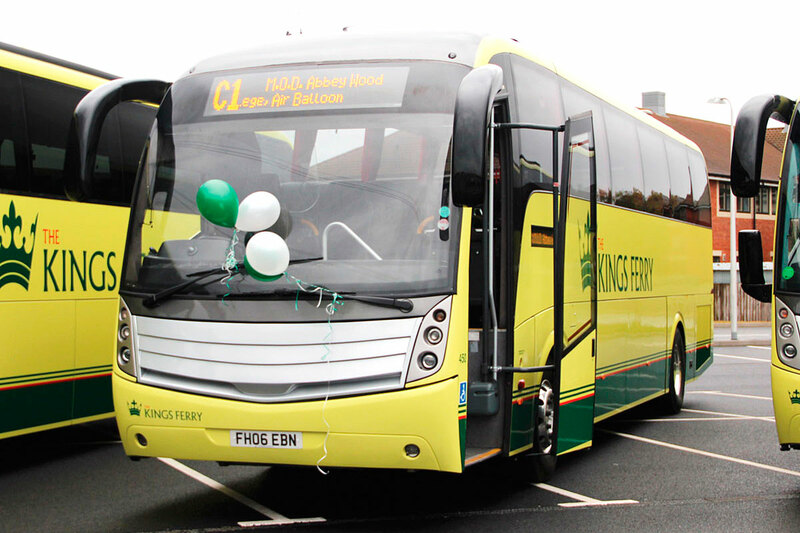 The spare coach is a former National Express Volvo B9R Caetano Levante that has been refurbished for the role. 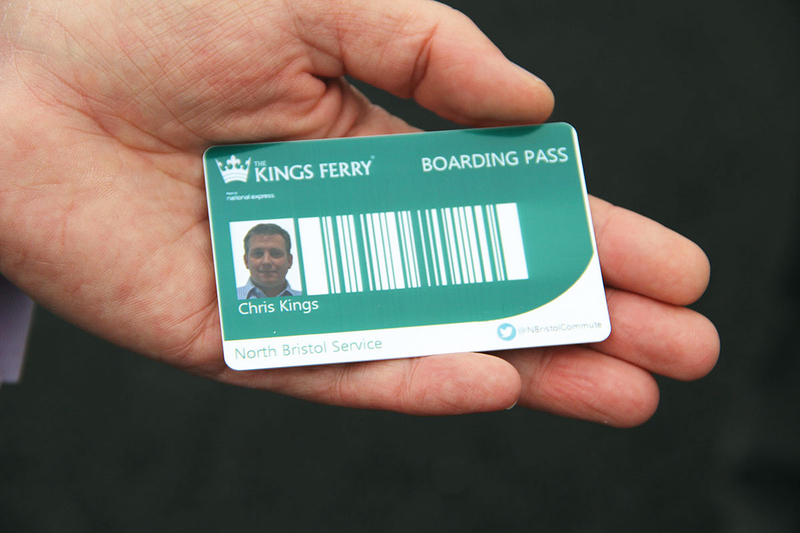 In what may become a blueprint for similar schemes elsewhere, The Kings Ferry has launched a network of commuter services between North Somerset and business districts of North Bristol/South Gloucester after winning a tender issued by North Somerset Council (NSC) with support from the Government’s Local Sustainable Transport Fund (LSTF). NSC instigated the project in 2012 after its research revealed that there was a need for a new transport link between the area, which includes Weston Super Mare, Portishead, Clevedon and their environs, and the North Bristol area which is a growing employment centre. One of the key employers in the area is the Ministry of Defence which has relocated much of its operation away from London to Abbey Wood. Other employers in the area include Rolls Royce, Airbus. The NSC research showed that thousands of people were commuting by car and that the available car parking space, much of which is currently free, was becoming oversubscribed. To alleviate this, reduce congestion and provide a sustainable and cost effective alternative to the car, NSC sought to introduce a commuter coach operation, winning the LSTF backing to kick start it with an initial two years of funding and subsequently issuing a tender inviting operators to offer the best package to utilise the available funding. Eight separate services are being offered, all of which utilise the M5 motorway. Services C1, C2, C3 and C4 depart from Locking Road car park opposite the railway station in Weston-Super-Mare at 06.15, 06.45, 07.15 and 08.08 respectively, calling at 11 stops in Weston-Super-Mare before joining the M5, coming off to call at Clevedon, and rejoining the M5 before dropping off at five stops in North Bristol at Aztec West, Rolls Royce/Gipsy Patch Lane, Filton Airbus/Filton College, Filton Air Balloon Public House/Filton Church and Abbey Wood MOD. The coaches arrive at Abbey Wood, the final stop, at 07.12, 07.48, 08.20 and 09.11. Services C5, C6, C7 and C8 serve the Portishead area. They depart from The Triangle in West Hill at 06.45, 07.45, 08.20 and 09.00 calling at six stops before joining the M5 and continuing to the same five final stops as the C1-C4. Return departures are at 16.00, 16.45, 17.15 and 18.30. There is an additional stop at Cribbs Causeway, with its major shopping outlets, that will only be served by the 09.00 (C8) service and the 18.30 return journey. A launch was held at the Worle park and ride site in Weston Super Mare on the Thursday preceding the commencement of operations on Monday 4 November. 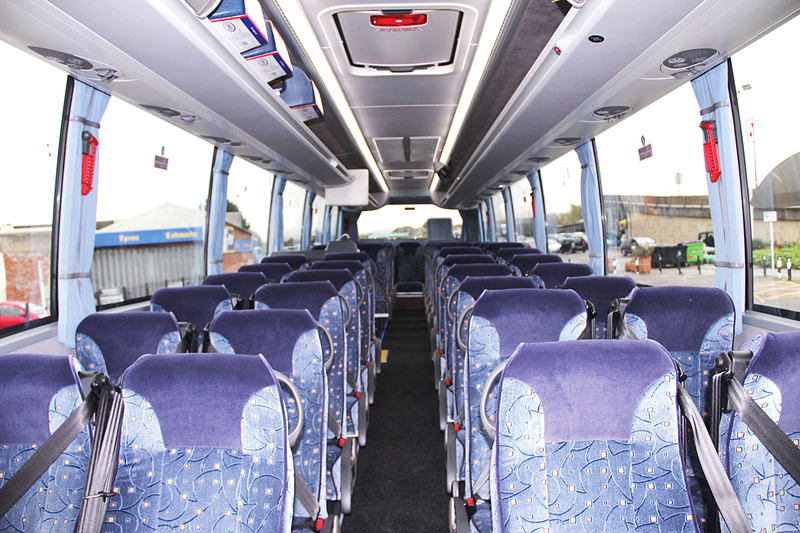 This enabled the entire launch fleet of five Volvo B9R Caetano DDA-compliant coaches to be displayed. Launching the services, Tom Stables, MD UK Coach for National Express, said, he believed it had, ‘the potential to make a difference for lots of people.’ He referred to the successful operation running in the South East where The Kings Ferry had 30 years experience, saying that punctuality was the key, which was why all coaches were tracked to keep customers informed. He thought the services would help to reduce congestion and was working with NSC on that. Engagement with partners was the key to success. He was positive about the advantages of the integrated ticketing system which was easy to use, though the units cost a bit. Currently unique to the North Somerset operation, National Express was looking at whether to roll out technology of this type across the whole network. Deputy Leader of North Somerset Council, Elfan Ap Rees, whose responsibilities include the transport brief, commented, ‘we are pleased The Kings ferry has seen this as an opportunity outside of the London area and has set up here. We sincerely hope people will use this service and make it an absolute success.’ He confirmed that the Council had liked The Kings Ferry’s experience in the South East. He said the funding involved through the LSTF was £600,000 over two years and the operator would be matching that. Ian Fraser, Joint MD of The Kings Ferry, told me that it was the furthest away from its headquarters that the business had ever established an operating centre. He saw the establishment of an operation in the South West as an opportunity and he was busily looking at how the vehicles could be utilised at weekends. Though the coaches were dedicated to the commuter runs from Monday to Friday, he was hopeful that the size of the local fleet would grow, perhaps to as many as ten coaches, over the coming year. He was already talking to other companies about work that would justify this. Bristol is an important node within the National Express network and one imagines that the availability of DDA compliant coaches from an in-house operator may well result in additional scheduled duplicate work for the Kings Ferry fleet. Ian said that the council had used ANPR technology to measure where people were joining and leaving motorways to help in designing the systems. He also said that the management team had spent two weeks visiting local employers promoting the services to them and their employees. Many local employers are part of the SusCom (sustainable commuting) group that pushed for such a coach scheme to be established.